This cringe fest is cancer to my brain. Judging from this article and the excerpt I read, I feel as if this is basically just a fanfiction. I personally do not feel as if there can be that much content in the book, as this would seem hard to write and produce. Hey, Akeenan65. Thanks for commenting. 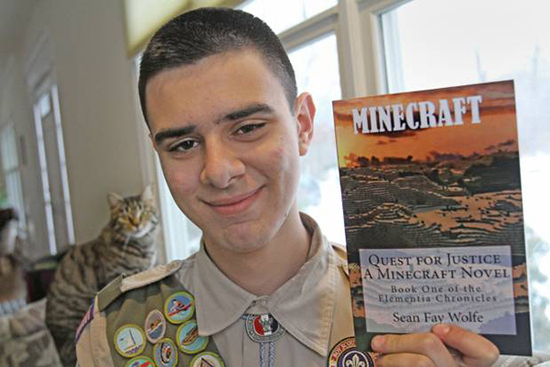 It’s true that hhe book is an “Unofficial” Minecraft story, so it doesn’t add to the true Minecraft story. But that doesn’t mean the content is lacking. It’s actually a fun, exciting read with heroic, well-developed characters. I think the “fanfiction” label is a bit misleading. The author actually worked for a long time to develop and write the story, and it has been edited and published by Harper Collins, one of the largest, most-respected publishers in the world. Still, it may not be to your liking. I’d be happy to answer any questions about it, if you’d like. do u watch minecraft vids on utube? Do you ever play on any popular minecraft servers? If so which are your favorites? And finally what is your gamertag just in case i ever see you on one? This is on my Christmas list. Congratulations on your achievement. I would like to be an author someday but I’m definitely going to be an Eagle Scout when I get older.